American Wine Story: The Good, The Bad and The Ugly – It's Wine By Me! 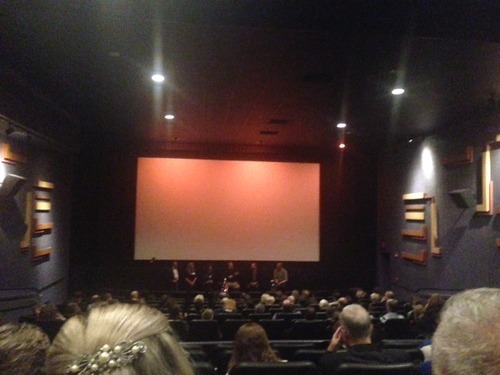 A fuzzy photo I took during the post-movie Q&A with the director and winemakers. Last night I attended a screening of American Wine Story here in D.C. It’s a documentary focused on passionate winemakers who left their everyday lives to follow their dreams. It sounds a bit hokey, but it wasn’t. And if you’re in love with wine – and the stories behind the bottle – you will completely relate to these people and most likely be in awe of their ability to take such huge risks and work extremely hard and long hours for either very little or no profit (at least in the first decade or so). There’s no denying that these people are in pursuit of their wildest dreams. The screening I attended was also a fundraiser, and included a tasting of the wines featured in the films plus a post-movie Q&A with some of the the winemakers. Overall it was a great event, and I’m glad I attended. If I were among the organizers, I would deem the event a rousing success. It’s a beautifully shot film and it was very fun to try the wines and hear directly from some of the featured winemakers. The focus wasn’t centered on California, but other wines across the country: A lot about Oregon, some Virginia and a little Missouri and Arizona thrown in. During the Q&A, there were some lovely gems by Luca Paschina, the Italian winemaker at Barboursville, who’s been making wine in Virginia for 25 years. He recognizes success in wine is not just about quality, but the relationships you make. That sentiment is actually an underline current in the film – especially during the telling of Oregon’s Brooks Wine. Luca was realistic, too: Passion is not enough, he says, you have to be in the right place. And I’ll add: at the right time. The opening reception was a bit too long, and the Q&A was a bit too short. Also, not all the wine tables were manned by representatives of their brands (although many were). I realize that’s a difficult thing to manage, but it’s a much different experience when the people pouring the wine have intimate knowledge of it. With a price of $50 to attend the screening of a film that is now available on iTunes, I had slightly higher expectations (maybe, a bit too high). Fortunately, there’s really not much to write in this category. Attending by myself was a bit lonely during the reception and before the movie began. It didn’t help that there was no cell service in the building. It was a cold and rainy night. Many in attendance had gray or white hair, so I felt a little out of place at times. And those who appeared to be my age were there because they were in the wine business. I had hoped that some other younger (and by younger, I mean 30- or 40-something) enthusiasts might have been there. Or maybe I just was circulating in the wrong parts of the room at the wrong times. Lots of talk of passion in @thewinemovie. It's like I found my people.